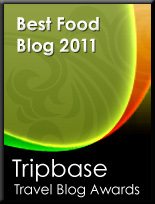 A fellow friend and fierce culinary competitor Dagfinn calls me "Trøffelhelten", meaning truffel hero. He is here toying with the Norwegian word "tøffelhelt" meaning "door mat" as in "her husband was a door mat". 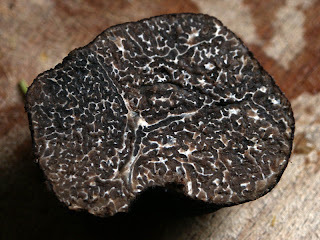 Whereas the latter has a negative connotation the former is a word of honour, as I love truffles, and here is an appetizer to prove it. I bought a glass of sauce with white truffles from Piedmont in Berlin 15 months ago. As I expect dinner guests, I checked whether I had some yummie to serve, I discovered this hidden delicacy in the back of my “foreign food shelf” in my refrigerator. My heart nearly stopped beating. Had its use by date expired? I am pleased to say that it had not. The question I asked myself was how to use this sauce. I opened it up, and had a taste. 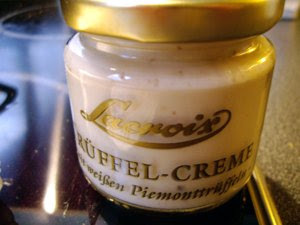 It was definitely a culinary bombshell, deliciously creamy, packed with those pungent truffle aromas. You are well adviced not to mess around with this precious sauce with ingredients that will compete with these delicate aromas. I decided to buy a packet of Italian raviolis filled with another famous mushroom, the porcini. 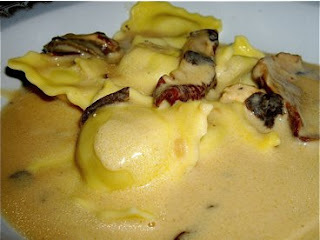 I planned to warm the sauce, pour it over a small portion (4-5) boiled raviolis and, sprinkle a little truffle oil. I followed my own culinary intuition and found that it was a clever idea. The sauce was very thick so I thinned it with a little single cream, added some dried porcini mushrooms that my brother has prepared, balanced the taste carefully with some sugar, salt, and enhanced it further with some white truffle oil. It was served in my 160 year old Staffordshire dinner set. The ingredients released its subtle, yet exceptional aromas - a sensational taste experience. Sadly the glass of white truffle sauce is now history. I have to go back to Berlin and buy some more. 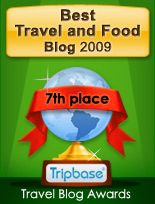 And then the main dish……..
Chicken Cordon Bleu is a dish I have prepared before, and you will find the recipe her on Enjoy Food & Travel. In short it is a stuffed chicken breast with Dijon mustard, cheese and boiled ham, rolled in bread crumbs and baked in the oven. A real treat. I altered the recipe slightly. I took 2 teaspoons dried tarragon and mixed with 4 tbsp Dijon mustard, making enough for the chicken as well as for a sauce. I prepared the chicken with the perfumed mustard, and made a sauce using one onion, finely diced fried until golden in butter. I then added 1 teaspoon flour stirring well before adding 10 cl water, salt, pepper, the rest of the mustard and 10 cl single cream (20%). This created a mustard-tarragon theme throughout the dish, and a dash of truffle oil created another bridge from the starter to the main dish. 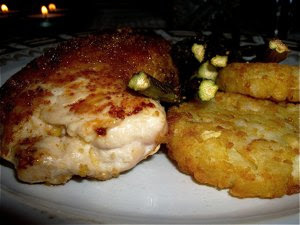 The chicken with sauce was served with rösti potatoes and baked asparagus.